Learning the alphabet is fun with these easy-to-read books on kidsÂ’ favorite topics from apples to zebras! Inside this sturdy little box, youÂ’ll find 26 photo-filled nonfiction titles that target and teach the shape and sound of each letter PLUS a mini-activity book, motivating stickers, and more. 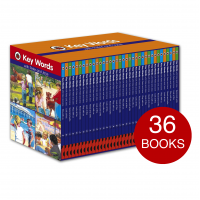 A one-stop resource to teach your child the ABCs so they can soar as readers! Includes 26, 8-page books, activity book and stickers.